The Langtang and Helambu Trek, go at once visit three major trekking destinations Langtang Valley, Gosainkunda Lake and Halambu Valley. 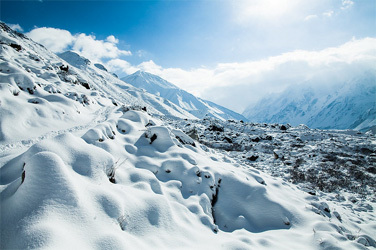 Langtang region is a third most popular trekking destination in Nepal. However, it is still less crowded than Annapurna and Everest region. Langtang region lies to the North of the Kathmandu valley near the Tibetan border. The Langtang and Helambu trek is generally starts from Syabru Besi on the edge of the Langtang National Park, about 7 hours driving from Kathmandu but if you preferred steeps climbing from begins better to starts the trek from Sundarijal where we end our trek. The trek from Syabru Besi, the trail gradually ascends upstream along the Bhote Koshi River, passing through the forests of the Langtang valley to the alpine meadows and yak pastures around Kyanjin Gompa. Most of trekkers are planned to stay extra night in Kyanjin Gompa to ascent the Kyanjin Ri (4773m) or Tsergo Ri (4984m) from where the 360 degree mountain views are truly spectacular. At Kyanjing Gompa you get close up views of Langtang Lirung (7246m) and other mountains that separate Nepal from Tibet. After your time spent in Kyanjin Gompa, you now return down the valley mostly downhill before you get the upstream trail goes to Thulo Syabru. From here, we further trek to the Gosainkunda Lake situated at an elevation of 4460meters. Over the years the Gosaikunda has become one of the sacred pilgrimage sites for Shamans, the traditional witch doctors, as well as many Hindu and Buddhist devotees. After Gosaikunda we continue across the Laurebina pass (4620m) towards the Helambu valley. Helambu is a region of highland villages in Nepal. After we arrive in Tharepati there are two trails one goes to Melamchi Gaon to end the trek at Melamchi bazaar or Timbu and one trail goes Kutumsang which is we follow to end our trek at Sundarijal. Most of Teahouses /lodges are damaged by 2015 earthquake in the Langtang region but today all teahouses are ready to use again and the condition of this trek route is perfect. Today is better to wakeup early morning for the sunrise view with magnificent views of Mt. Ganesh Himal, Mt. Manaslu, Mt. Gaurishanker, Mt.Dorje lakpa, Langtang Himalaya ranges and Annapurnas. First part of trek climb up the last pass of the trek Borlang Bhanjyang (2440m) close to Shivapuri Hill. From here we descend steeply through deeply eroded chasms towards the Tamang settlement of Mulkharka (1800m). From here on it is a short bit to Sundarjial as we walk past the local water supply system and follow the water pipe to this village. From Sundarijal we can take local transportation, or have our private transport waiting for us to bring us back to Kathmandu.